The Board sustained an opposition to registration of the slogan REMEMBER THIS NAME for legal services on the ground that the phrase does not function as a service mark. Applicant Lundy Law failed to provide direct testimony or survey evidence regarding consumer perception of the slogan as a source indicator. Larry Pitt Associates, P.C. v. Lundy Law, LLP, Opposition No. 91210158 (March 6, 2018) [not precedential] (Opinion by Judge Marc A. Bergsman). Procedural Issues: The Board denied Lundy's motion to introduce into evidence, well after the close of trial and briefing, a single Facebook posting due to the lateness of the request, the lack of significant probative value, and the prejudice to opposer in delaying further this five-year old proceeding. The Board limited the testimony of each party's expert witness to legal marketing issues, and refused to consider any assertions regarding how consumers would perceive applicant's mark, observing that the opinion of purported experts may not "serve as a substitute for the Board's judgment on the legal claim" before it. Finally the Board jettisoned various items of proposed evidence, ruling that they were not eligible for submission via notice of reliance: including a written analysis of Lundy's advertising, video and audio recordings of use of REMEMBER THIS NAME by third-parties and by Lundy, and email communications involving Lundy. The Board noted that the documents that are eligible for a notice of reliance are registrations owned by a party, Internet materials, and discovery responses. See Rule 2.122(e)(1), (e)(2), (g), and (k). Standing: Opposer Larry Pitt did not discuss the threshold issue of standing, but the Board found from the evidence that the parties are competitors in the field of personal injury law. Failure to Function: The critical issue in determining whether a designation functions as a mark is how the relevant consumers perceive the purported it. "The mere fact that a designation appears on the specimen of record does not make it a trademark." There is no question that REMEMBER THIS NAME may be considered a slogan, tagline, or a “call to action” used in Applicant’s advertising. The issue is whether REMEMBER THIS NAME as used by Applicant performs the function of a service mark by signifying to purchasers the source of the legal services being offered by Applicant. The Board observed that 1-800-LUNDY LAW is the prominent element of applicant's advertising, while REMEMBER THIS NAME is the least prominent. [The definition of trademark] contemplates use in such a manner as to fulfill that function and clearly does not contemplate that the public will be required or expected to browse through a group of words, or scan an entire page in order to decide that a particular word, separated from its context, may or may not be intended, or may or may not serve, to identify the product [or service] of the manufacturer or dealer. Ex parte National Geographic Society, 83 USPQ 260 (Comm’r. Pat. 1949). 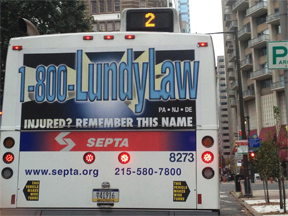 Applicant Lundy Law did not provide any direct testimony regarding consumer perception of REMEMBER THIS NAME as used in its advertising. The Board found that "[t]he impression created by Applicant’s use of REMEMBER THIS NAME is an advertising message, informational slogan or a 'call to action' rather than an expression to identify and distinguish Applicant’s legal services." Although such a phrase could serve as a service mark, it must be used in such a way that it is perceived as an indicator of source of the services being advertised. In this case, however, Applicant’s use of REMEMBER THIS NAME does not rise to the level of a service mark because there is nothing in the record demonstrating that the phrase REMEMBER THIS NAME creates a commercial impression separate and apart from the other material with which it appears in Applicant’s advertising. TTABlog comment: Shirley, applicant needed a survey to show consumer perception. BTW this case was argued at Tulane Law School on February 28, 2018. One week later, the decision!